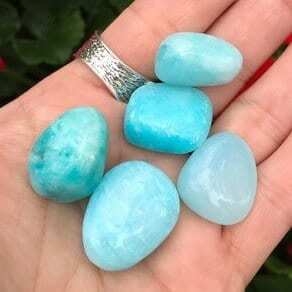 Hemimorphite - Buy Crystals Online Now at Happy Glastonbury! Hemimorphite is a gentle healing crystal bringing angelic healing to the troubled mind. For those who ‘think too much’; whose brain feels like it is running on overdrive constantly. This mineral when held sends out a signal to the angelic realm that someone requires a little help right now. This light, no matter how dim it appears on the physical plane, shine bright in the angelic realm and is easily followed right back to you. Your angels will draw near and hold you whilst you go through troubled times; during operations, hospital stays, pregnancy and birth. For all those times when you need comfort, this crystal delivers. Simply hold a piece in your hand, wire wrap a piece to wear or keep in your pocket. When required, hold and send out that thought of ‘help’ and your angels will come.